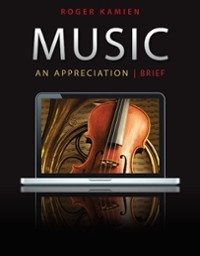 Music: An Appreciation, Brief Edition 7 Edition What does it take to make a great performance? It takes great music, a great performer and a great instrument.Music: An Appreciation includes some of the greatest music ever created. Roger Kamien’s excellence as an interpreter of that music has made his program number one in the market used by over half a million students since its conception. Now, CONNECT Kamien provides the world-class instrument that allows Music: An Appreciation to bring great music to his audience in an extraordinary new way.Music: An Appreciation is great music, a great interpreter, and a great instrument.